Best Action Cameras for Kids - Explore, Capture and Share. If you were to ask me to write an article about the best action cameras for kids 10 years ago; I would of said you were crazy. I would of told you; no way are kids using action cameras. Granted, GoPro introduced their first action video camera back in 2006 – it wasn’t until 2010 that they became more affordable and mainstream. 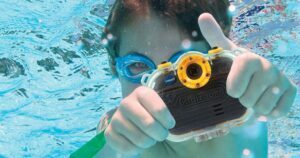 We are fans of these action cameras because it is just the way kids and technology are evolving. Gone are the days of using 35mm cameras that require photo processing that used to take up to a week. Kids want their pictures and videos right away for viewing and sharing with friends on social media. With endless uses; swimming, biking, skateboarding, hiking, sightseeing and more; your kid will never be bored. The cameras allow parents a sneak peak of your child’s view of the world and their adventures. Here are a few items that we feel are important when shopping for a action camera or a go pro for kids. Durability – Lets face it; kids are hard on everything. You want to look for cameras that have sturdy designs and protective cases. We highly recommend wrist straps; similar to what you would see on a Nintendo Wii controller that has a mechanism to tighten around a childs wrist. Another idea is to connect the camera to a lanyard and hang from your childs neck. Water Resistant – For those underwater action videos, taking videos in in-climate weather or in the event that your child leaves the camera outside in the rain – this is a must-have feature. Price/Value – Who wants to spend too much on a camera or buy a cheap action a camera for the sake of the low price? Image Quality – Still images are measured in megapixels (MP), while video quality is measured in Frames-per-second (FPS). The higher the number the better. Battery Life – The longer the better, right? Most action cameras for kids will use disposable batteries; which we prefer because the batteries (typically AA) are easily available and extras can be packed along during a trip. Models with internal batteries can be charged with included USB cables. Memory/Internal Storage – Memory and storage equate to how many photos or hours of video can be stored on the memory card. Cameras will use either a Micro SD or SD card. Check to see what size memory card is pre-installed and whether it can be upgraded to a larger size. Some of our favorite action cameras for kids are the Ourlife Kids Camera and the VTech Kiddizoom Action Cam 180. Our number one action camera for kids comes from Ourlife. Out of all the cameras we reviewed, this model had the highest image quality of 5 mp and a video quality of 30 fps.The Ourlife Action Camera provides a lot of bang for the buck. This action camera for kids includes an 8 GB memory card, wrist strap, 2 camera mounts, USB cable, helmet fastening strap and water proof case. Take photos, selfies and record videos on the go. Playback videos enabled. The Kiddizoom from VTech is second on our list of action cameras for kids. It has all the features we are looking for: carry strap, water resistant protective shell and a unique mount that allows the camera to rotate 180 degrees. Includes two platform-style games and one augmented reality game for even more fun. Although there are many action cameras available, the two models above are the ones that we are most familiar with. They also come from known electronic companies that stand behind their products. We will be expanding on this article as our research continues. This entry was posted in Gear and tagged action cameras, for kids, gopro, kiddizoom, ourlife, video camer, vtech. Bookmark the permalink.